I disagree with your surplusage of funny monkeys. There can never be enough funny monkeys! 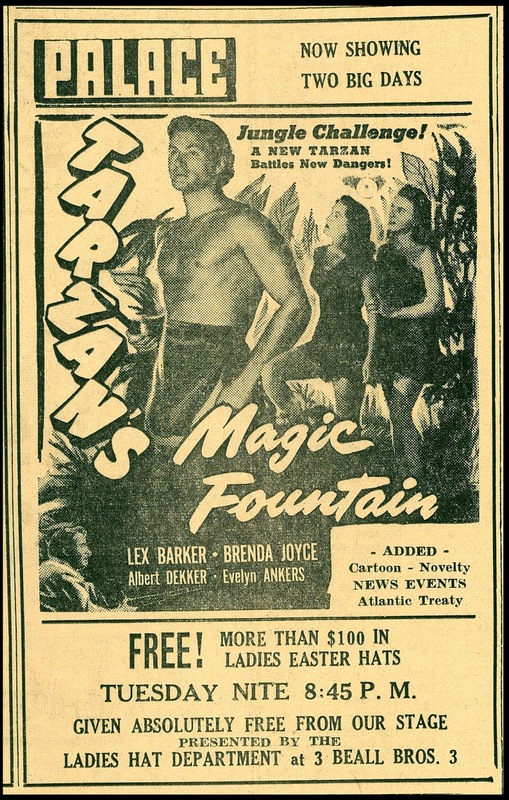 Back in the sixties, my brother and I gobbled up all Tarzan's adventures on TV (and even a couple of kiddie matinees courtesy of Jock Mahoney and Mike Henry). Alas, in our estimation, Barker was dead last in the jungle man hierarchy, the Joe DeRita of screen Tarzans, if you will. Even by our very lenient standards, he seemed to be sleepwalking through the last couple of entries. Of course, decades later step-daughter Cheryl Crane would declare he was more creepy than sleepy but that's another story. A friend of mine referred to Barker's Tarzan as "the pretty one." After Johnny W., Gordon Scott was a great Tarzan. I'd vote Gordon Scott as best of ALL the Tarzans. If only we could have Tarzan's Greatest Adventure restored and on Blu-ray. It is a movie that lives up to its title. I nominate Herman Brix. His take on Tarzan appears to be closer to author (and producer) Burroughs's conception of the ape man, with the jungle lord speaking in complete sentences and handling any and all perils of the wild with dispatch. I didn't know who Tarzan was when I saw 'Tarzan's Greatest Adventure' as a 7 year old. It had me on the edge of my seat from start to finish. Gordon Scott gets my vote as the best Tarzan on the basis of 'Greatest Adventure' and 'Magnificent'. I must have gone to the theater to see the co-feature but I can't remember what it was. 'Tom Thumb' maybe? I wandered into another nail biter around the same time, 'Edge of Eternity', the same way. Went to see the co-feature, another I can't remember. I agree with Gordon Scott as the best Tarzan. I thought everyone here would be all over me for not picking Johnny Weismuller. So...Here's to Gordo, who even vanquished a future James Bond. Glad to see TARZAN'S GREATEST ADVENTURE and TARZAN THE MAGNIFICENT getting positive recognition. They deserve it. They're great movies. Read somewhere, that after Greatest Adventure, Connery was offered Tarzan. Dunno why they were so eager to dump Scott, finally giving it to Jock Mahoney. Scott's contract with producer Sy Weintraub expired after shooting TARZAN THE MAGNIFICENT. Weintraub wanted Scott to continue, but on a feature-to-feature deal. During that time, producer Dino De Laurentiis offered Gordon a more lucrative multi-year deal to make sword and sandals pictures in Europe. So Gordon went that way. That's what Gordon told host webmaster McElwee and me the weekend we drove Gordon around Burbank. As for Connery offered the role, I doubt that happened. As planning began for the next Tarzan feature, social and political problems in Kenya prohibited the shooting of the upcoming Tarzan feature there, so there were delays before things could be worked out to lens the movie in India. By that time, Connery was signed with Albert Broccoli to make DOCTOR NO. Gordon said that as soon as he turned down the opportunity to return, Weintraub signed Mahoney, who had impressed him in MAGNIFICENT. Scott may have made the best Tarzan films, but he wasn't much of an actor. As for Mahoney, he seemed more like a middle-aged businessman taking an exotic holiday (which reminds me of 'Tarzan and the Valley of Gold', with nattily-attired Mike Henry flying into Mexico City and asking somebody to get him a loincloth). I've recently been watching Mahoney's short-lived 1958 western series 'Yancy Derringer', which is an underappreciated gem. Set in 1868 New Orleans, it's like a better-produced 'Bat Masterson' and features Mahoney as a colorful gambler who fights baddies, charms the ladies, and does at least one impressive stunt per episode (he's especially good at jumps). It was certainly Jock's finest hour. To his immense credit, Mahoney finished Tarzan's Three Challenges while suffering from dysentary wasting away onscreen from a drop of 45 pounds. Burt Reynolds' Hooper has Brian Keith playing a veteran stuntman "Jocko". When Ron Ely visited Mahoney in the hospital, He told Ely that he had played a role he wanted - Doc Savage. While no Lex Barker, Mahoney was recently mentioned during a Sally Field interview (doing press for her "Doris" movie) as a being "verbally abusive" stepdad. In his new book, Burt Reynolds said he felt that relationship was in some way abusive.The reason, I Guess, that he never hired Mahoney.